and learn new things ... What about you? Whether big or small, feathered or furry, the first day of school can be a lot of fun! 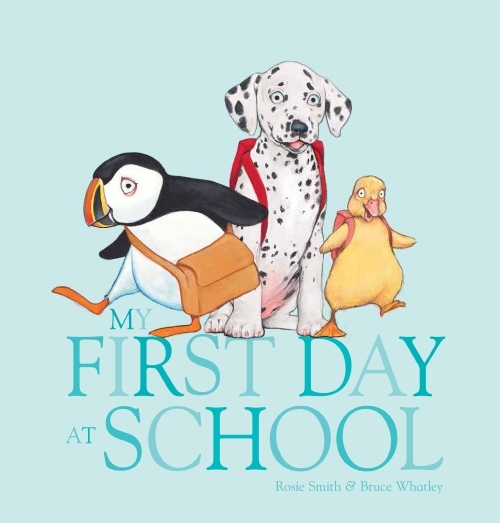 Beautifully illustrated with delightful animals, My First Day at School captures the fun of learning and making new friends at school. South Wales UK. Currently in Bundanoon NSW. Fight. Always seemed to get in fights standing up to bullies. Didn’t win much. Rupert Bear but grew up on comics. Chris van Allsburg — author/illustrator. Anything Italian. Used to be yellow but now turquoise. Ice Age. Combination of other illustrators — Norman Rockwell, Maxfield Parrish, Howard Pyle. Drew from an early age. Went to Art College then worked as an art director and illustrator in the advertising industry in London and Sydney. Picture books came later which in hindsight is a much better fit for me. 21 when I first worked in advertising but 38 when my first children’s book came out. It was a natural development in that I have always had an ability to draw. As a bricklayer I’d make a good illustrator! Its what I do. Ideas can come from anywhere. If you are lucky, you wake up in the morning with one. Most of my ideas come from my family; things that we say or do. It is possible to 'manufacture' an idea but the best come from inspiration. I’ve been a bit nomadic for the last two years and have been taking my work on the road. I miss not having a permanent studio with a big drawing board and my favourite things around me. Recently I have worked on kitchen tables, desks in hotels, on portable drawing boards and on my lap. Being able to create new worlds and extend narratives. And to always find new techniques to do so. After seeing the cover of a foreign edition of one of my books I wrote to the publisher saying it was outrageous they got somebody else to do the cover illustration and that it was the worst cover I’d ever seen. Turned out I did it a year previously in a rush overnight. I didn’t recognise it because they flipped it, which accentuated my bad drawing and changed the colour of the background. Very embarrassing. Write so I can illustrate. And sail when I can. Brain surgeon but I couldn’t pronounce any of those long words! Work a lot with my wife Rosie Smith who has been the source of many of our ideas. Also started to illustrate with my son Ben using CGI 3D programs.